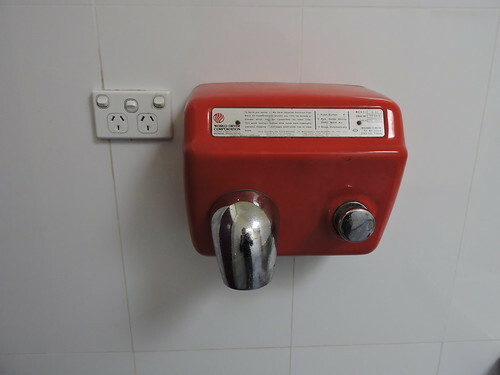 'World Dryer' warm air hand dryer dating from construction of the school it resides in in 1979. The fire engine red was part of the original building's colour scheme which included the bench tops, tapware in the toilets, steel structural beams and 'Plasteel' window frames - all since painted over. The red was in contrast to the dark blue pin up carpet that formed the internal walls - still in place in parts. World Dryer Corporation is based in Berkeley Illinois, USA and dates back to the early 1950's with their Australian distributor JD MacDonald in Melbourne at the time - who would later manufacture dryers under their own name. This unit is a 220-240 volt version which connects to an Australian (Type I) 10 amp General Purpose Outlet - an example of which is to the left.